Welcome to our online Chevrolet accessory catalog and our Collision/Mechanical Chevrolet parts catalog. Select a catalog to the left and choose your vehicle. Please contact us if you are unable to locate the Chevrolet car parts you are looking for. 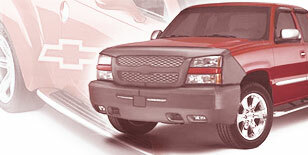 Our site is constantly being updated with new genuine Chevrolet parts and Chevrolet accessories. Our Chevrolet catalog contains over 200,000 parts and accessories. Parts - air filter, alternator, antenna, brakes, clutch, distributor, egr valve, emblems, engine mounts, fuel filter, fuel pump, hub caps, ignition parts, ignition switch, interior parts, mass air flow sensor, mirror, oil filter, oxygen sensor, park light, radiator hose, seat belt, serpentine belt, shock absorbers, starter, struts, tail light, timing belt, timing chain, turn signal, water pump, window regulator and wiper blades. For models: Avalanche, Tahoe, S10, Cavalier, Corvette, Trailblazer, Impala, Malibu, Suburban, Silverado, Monte Carlo and Colorado. Accessories - brush guard, alloy wheels, bed tent, bike rack, cargo organizer, car bra, car cover, cargo mat, cargo net, hood protector, floor mats, fender flares, side window air deflectors, tonneau cover, mud flaps, nose mask, rear spoiler, roof rack, side steps, ski rack, splash guards, security cover, trailer hitch and wheel locks. For models: Avalanche, Aveo, Cobalt, Colorado, Corvette, Equinox, Express, Silverado, Suburban, Tahoe, Trailblazer, Uplander, HHR, Impala and Malibu. If you are unable to locate the Chevrolet auto parts you are looking for in our online Chevrolet catalog please use the Contact Us button to let us know what Chevrolet car parts you are looking for.